Please note that the content of this book primarily consists of articles available from Wikipedia or other free sources online. 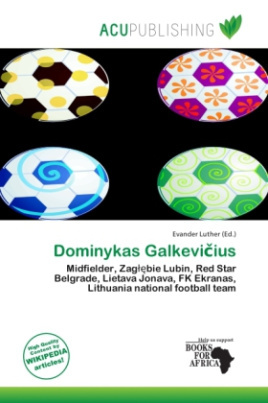 Dominykas Galkevi ius (born 16 October 1986 in Jonava) is a Lithuanian football midfielder currently playing for Zag bie Lubin. In November 2010, he came on trial to Serbian side Red Star Belgrade. In 2011 he joined Zag bie Lubin on two and a half year contract. On 25 May 2010 he made his national debut against Ukraine in Kharkiv. In association football, a midfielder is a position. Some midfielders play a more defensive role, while others blur the boundaries between midfielders and forwards. The number of midfielders a team uses during a match may vary, depending on the team's formation and each individual player's role. The group of midfielders in a team is called the midfield.